ON/OFF control with fixed hysteresis. LED display for the control output action. 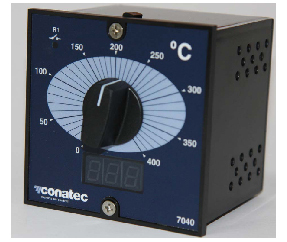 Available * for thermocouples J and K.
Available * for power supply at 230 Vac or 24 Vac. Power supply 230 Vac +/- 10%. or 24 Vac +/- 5%. Consumption 8 VA.
Potential-free relay output with cut-off capacity 5A/230Vac in a resistive load. Format 96x96. Panel cut-out 92x44 + +0.8 mm. Depth 90 mm including the connection terminals.